I am reading a book on business design currently. I will post a link to it soon. I have heard the concepts in this book espoused in different ways. 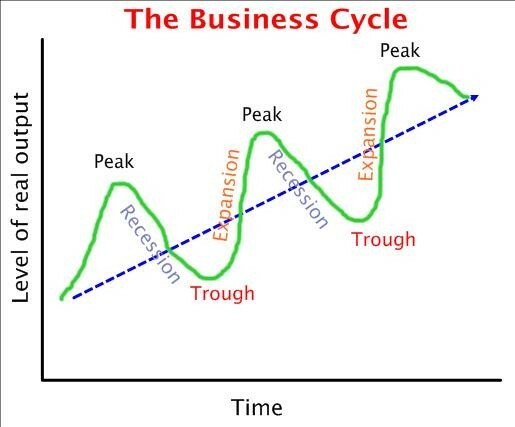 One of the old ways was simply the maturity cycle of a business represented in the graph below. When looking at a single business the peak really represents the full leverage of an idea in its current form for that business. Its leadership cannot take it any further without further innovation. Good leadership makes sure there is always new thinking and ideas being invested in, so that part way up the climb a second and third curve is forming. By doing this, although product lines or iterations of service change, the troughs are "hidden" by waves of growth that keep the company moving forward. Now how about your life? Are you doing the hard work of monitoring your growth? Seeing the end of a cycle in your own life and preparing innovation for the next phase. Are your children about to leave the home for university? Have you started building new hobbies, traditions activities with your spouse and grown children to keep those relationships growing through the next phase? How about career? What are you working on, how are you growing? Life design is much like business design. You have to think ahead and continue to innovate to avoid troughs. Make no mistake, the trough is still there. Your child is still leaving for university, but the positive distraction of the next innovation keeps everything moving forward.